I wrote about Mirindo last year and how my student gave me some senbe from them. 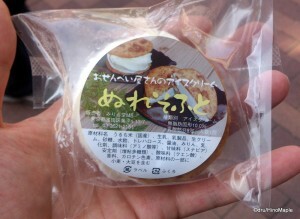 They are an Oshiage staple and recently I had the opportunity to try their senbe ice cream. 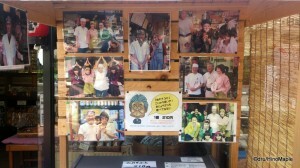 They have a nice freezer outside the shop with lots of pictures telling visitors which famous people tried the ice cream. It was something I had to try and it wasn’t bad. It was a standard offering and the ice cream itself was overly chilled. It was hard to eat at first but because it was a hot day, the ice cream melted quickly and in hindsight, the temperature of the ice cream was perfect. It started off too cold and by the end it was starting to get too warm. The mix of a salty senbe and sweet ice cream was very strange at first. It was lovely at times but at other times it wasn’t very good. If you enjoy a little salt on your watermelon, you’ll probably love it, but for me it wasn’t the best in the world. I will still have it again if I am in the area and I feel like enjoying it, but it isn’t something that is high on my “to eat” list. 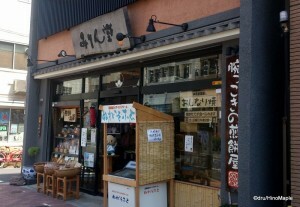 If you are tired of the crowds at Solamachi, head 1 block south of Solamachi onto the main road and look for Mirindo and grab a nice ice cream treat. This entry was posted in Tokyo Food and tagged ice cream, Ice Cream Senbe, japan, Mirindo, Oshiage, senbe, Sky Tree, Tokyo Sky Tree, Tokyo Sora no Ki by Dru. Bookmark the permalink. “If you are tired of the crowds at Solamachi … ” I get tired just thinking about it, so thanks for this tip! I like the combination of sweet and salty. A favourite South African sarmie (sandwich) filling is smoked snoek and apricot jam. Snoek is a South African fish; its smoked version is flaky and very salty. The sarmie? I’d give it a try, but may not want to go more than one bite. Banana balls dipped in chili or tomato sauce? Sounds interesting as well.